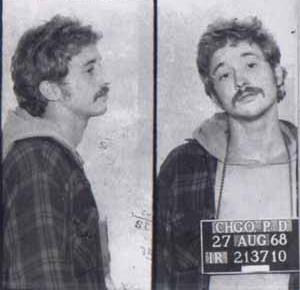 Barack Obama has tried to minimise his relationship to to former Students for a Democratic Society (SDS) activist and Weather Underground terrorist Bill Ayers. Meanwhile Obama's political opponents have racing the clock to uncover the Senator's links to his radical friend and colleague. I thought I'd try a different tack. Are there any current links between Ayers and organisations supportive of Obama? In this post, I revealed that Ayers's wife and fellow former terrorist Bernadine Dohrn was a board member of Movement for a Democratic Society (MDS)-an alliance of former SDS members and several Marxist organisations. I proved that Ayers also had ties to MDS and that there was a huge membership overlap between MDS and Progressives for Obama. This post will confirm Ayers's ties to MDS and his long term and ongoing links to two key pro-Obama activists and former SDS members, Carl Davidson and Mike Klonsky. Carl Davidson has occasionally commented on this blog, criticising my findings on Obama and his radical ties. Gee, Carl, why don't you talk a little about your background? ... Make sure you mention your recent relationships with Bill Ayers and Mike Klonsky. Now that that relationship is established, who are Carl Davidson and Mike Klonsky? Carl Davidson served on the MDS board after its founding in August 2006. He serves as webmaster of Progressives for Obama which he helped found with three fellow MDS board members Bill Fletcher jnr, Tom Hayden and Barbara Ehrenreich. Davidson is an American Marxist who serves as a national steering committee member of United for Peace and Justice, a field organizer for the Solidarity Economy Network, and co-chair of Chicagoans Against War & Injustice. The latter organization has formed alliances with such groups as the League of Women Voters, Rainbow/PUSH, Citizen Action, People for the American Way, the Progressive Caucus, the Congressional Black Caucus, and the Congressional Hispanic Caucus. Aiming ultimately to transform the United States into a socialist nation, Davidson advocates the mobilization of "new grassroots majorities required for progressive, systemic change." In 1960s, Davidson was a national secretary of SDS and a key leader of the anti-Vietnam War campaign. With Tom Hayden, Davidson helped launch, in 1969, the "Venceremos Brigades," which according to Discover the Networks "
After the SDS broke up Davidson became involved in Maoist politics until 1992 when he became a leader of the newly formed Committees of Correspondence (CoC), a Marxist-Leninist coalition of former Maoists, Trotskyists, and former Communist Party USA (CPUSA) members. The organization has since changed its name to the Committees of Correspondence for Democracy and Socialism (CCDS). Davidson remains a prominent figure in CCDS alongside several MDS board members including Noam Chomsky and Manning Marable. 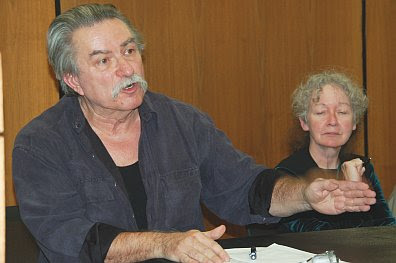 In the mid-1990s Davidson was a leader of the Chicago branch of the New Party, a Marxist political coalition whose objective was to endorse and elect leftist public officials. Most New Party members were also involved in the COC, the Democratic Socialists of America (DSA), or the militant leftist "community" organization ACORN. Other leaders of the New Party included later MDS board members Bill Fletcher jnr and Barbara Ehrenreich (both DSA leaders and Progressives for Obama founders)and Noam Chomsky and Manning Marable. Obama joined the New Party in 1995, before his Illinois State Senate run, where he met Davidson. The New Party publicly endorsed Obama, while Davidson and other Party members helped Obama's campaign. In 2002 Davidson and fellow former SDS member (now Obama fundraiser and Progressives for Obama endorser) Marilyn Katz, organised a large Chicago anti War rally where Obama first came out strongly against the Iraq War. Mike Klonsky joined the MDS board in 2006. Klonsky's father Robert, was a leading activist in the CPUSA. In 1968 Mike Klonsky was the national secretary of SDS and in May 1969 was one of five SDS members arrested when police raided SDS offices in Chicago. In late 1969, Klonsky founded the October League, a a pro-Mao communist organisation which in 1977 became the Communist Party, Marxist-Leninist (CP-ML). Klonsky chaired the CP-ML which was recognised by the Chinese Communist Party as their US fraternal party. Klonsky made several trips to China beginning in July 1977, where he was feted by Communist Chinese officials. The Workshop was given at least $175,000 by Chicago's Annenberg Challenge. This organisation was chaired by Barack Obama, who had been recruited for the job by a group which included Bill Ayers. Until June this year Klonsky ran a Blog on Obama's campaign website. Unlike several MDS board members, Mike Klonsky DID NOT endorse the Progressives for Obama campaign. 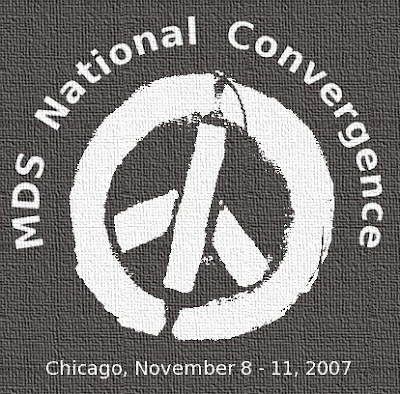 In November 2007 MDS held a "Convergence" in Chicago. Speakers included Manning Marable (MDS chairman, Obama supporter, CCDS, DSA), Mark Rudd (MDS board and Progressives for Obama, former SDS/Weather Underground), Marilyn Katz, Mike James (MDS board, Progressives for Obama, former SDS), Paul Buhle (DSA, Progressives for Obama, former SDS), Al Haber (founder of SDS), Franklin Rosemont (former SDS), Tom Good (MDS board, Progressives for Obama) and Muhammad Ahmad aka Max Stanford, a former leader of the SDS aligned black militant organisation- Revolutionary Action Movement. Of course Davidson, Klonsky and Ayers were also present. Bill Ayers as usual was a star, one of the few speakers whose thoughts were committed to video. Note Ayers's reference to MDS as "our work". Note his enthusiasm for building alliances and using the US elections to enlists "hundreds of thousands" of young people to his cause. Also note refence to Rashid Khalidi, an MDS linked, pro-Palestinian activist, a close friend of Barack Obama. Note Ayers's chiding of Obama for adopting centrist positions. Note reference to Progressives for Obama founder Tom Hayden's call for Obama to stay true to his anti-Iraq War position. All of this is completely in line with MDS and Progressives for Obama strategy. It is clear that the movement behind both organisations is not new. It has roots in the SDS of the '60s, the New Party of the '90s and leading strands of the American Marxist movement. 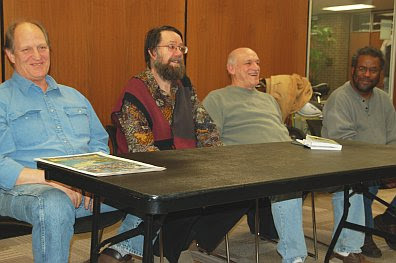 Davidson, Klonsky and Ayers have all played significant roles-sometimes seemingly in concert. The Davidson, Klonsky, Ayers "Toxic Trio" have all put their lives into the communist movement. They have all paved the way for Obama's political advancement. What do these committed activists expect from Obama in return for their considerable investment? I found this post via google. Haven't read your other posts yet. Has this work gotten any wider exposure? I've not heard anything on talk radio. There is such irony in this situation. Forty years ago McCain was a soldier in the fight against communism, nearly losing his life and permanently disfigured. Forty years ago, these people were soldiers in the same war--on the communist side. Today, McCain is at war with the same philosophy, and the same indivduals, apparently without recognition of the fact. McCain may lose this war twice. You haven't 'proved' much here. It's rather like finding my name in the phone book, and then 'proving' I have a phone. Of course Mike, Bill and I worked together in Chicago. We announced in on the Small Schools Workshop web site. And yes, they signed on to 'Progressives for Obama', I asked them to, and posted their names when they did. A bunch of us signed on to MDS as well, which isn't much of anything nationally, and believe me, who ought to know, it had nothing to do, as a group, with starting 'Progressives for Obama'. You pass on, however, one total lie, fabricated by David Horowitz, the one that claims the Cubans gave us 'guerrilla training'. When I called him on it once publicly, all he could do was turn red in the face and sputter. When people applying to go on Cuba trips made noises like that, we translated it as 'oink, oink,' and figured we had an agent on our hands. But keep at it! It's a fool's errand, but spinning your wheels here keeps you out of mischief elsewhere.